Join our Operetta and Folklore Performance-infused dinner cruise if you are looking for a uniquely special, entertaining, yet cultural experience! A truly outstanding experience, because we offer more than a simple dinner on a sightseeing cruise ship. We evoke the traditions of Hungarian culture in a spectacular, up to par performance. 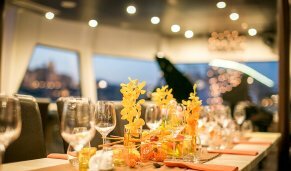 The cozy atmosphere of our Budapest dinner cruise is ensured by lighthearted, often humorous songs performed by the best musicians and singers of the operetta genre. A great opportunity for the fans of the genre to listen to the most popular opera and operetta pieces. The Budapest Dinner Cruise continues with the performance of folklore dancers dressed in traditional Hungarian costumes, to crown the high standard of cultural entertainment. The up to par, live instrumental music and the spectacular Hungarian folk-dance performed in traditional costumes results in an unforgettable experience. After the spectacular show, those who were swept away by the performance are given the opportunity to pick up the bases of Hungarian folk-dance with the help of our dancers. We offer not only a breathtaking show, but we give you the opportunity of dancing together and an experience worth sharing with your family and friends. Hungarian people are very proud of their traditional folk dances. If this really true is, shows that Hungarian folk dance is still famous, or -sounds better- famous again nowadays. There are folk dance festivals every year trough Hungary to help to keep this tradition alive. So what can you expect when you join our dinner cruise? Besides the amazing view and the live show the most important is the food, right? 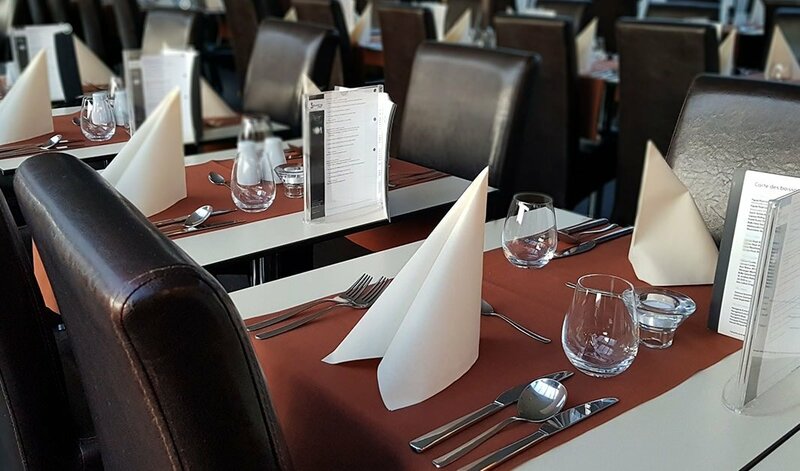 Our onboard chefs are ready to fill your empty stomach with delightful dishes even if you prefer international tastes or you are interested in the Hungarian cuisine. For example, as a starter, you can pick a simple salad, but if you are into the Hungarian style, you will love to taste the small pastry baskets filled with creams like paprika- and liver cream. This will definitely reflect the taste of the Hungarian people. If you eat in Hungary, the next course must be the soup, because Hungarian people are soup addicted, they have so many types of soups, you just think of one ingredient and they say what soup they could cook from it. A very important part of the meal. Here you can try a traditional goulash soup, originated from Hungary or a simple vegetable cream soup as well. What about the main course? Let us take it under a magnifying glass since there are so many vegetarian people nowadays, it is very important for us to fulfill their needs, just like the meat lovers will find a lot of interesting Hungarian specialties, for example, the duck or the „pörkölt” with homemade paste. What is „pörkölt”? have a look on our menu card where you will find all the dishes we serve on board. The second part comes when the ship starts the second round on the river and the dance team will join our dinner cruise. This show will be even more spectacular, as you will see a different style of folk dances (short description of Hungarian folk dances can be seen below) there will be solo dances and couple dances. Our guest will have the opportunity to try their talent and join them on stage. Even after the bottle-dance, the ladies will have the opportunity to test if they can balance a bottle of wine on the top of their head. Are you a type who always gets thirsty during dinner? Don't worry, your throat will never dry out, as our shipyard offers many opportunities for those with high demand for drinks. Our bartenders have a variety of drinks at our guests' disposal, whatever you want from the drinks list. But there is also an offer for those who care for drinks. A drink pack that includes drinks listed below offers unlimited drinks throughout the boat trip. Indeed, it guarantees unlimited beer or, for example, wine consumption during the entire dinner. Our drink package can be booked here, online or can get on board upon arrival as well. 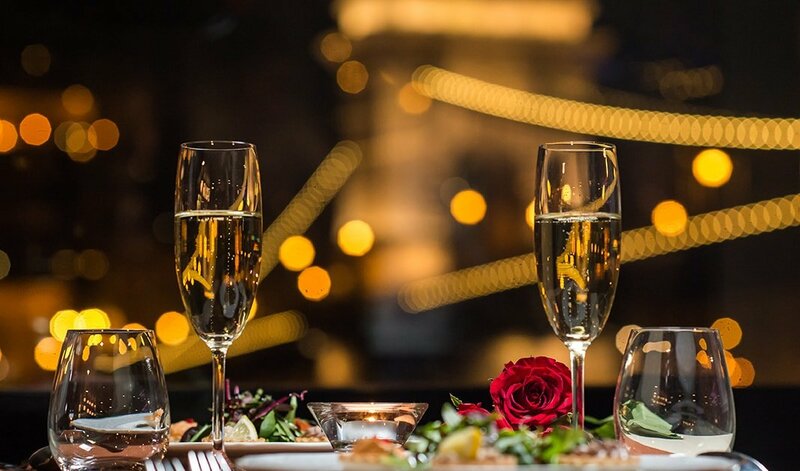 Includes alcoholic and non-alcoholic drinks as you like to drink a fruit juice before your appetizer or a coffee after the dessert, there is no limit for you, just tell our staff your wishes and they will prepare it for you. As a part of the Budapest Dinner Cruise, you may take a look at the most beautiful buildings of Budapest, get to know the bridges of the Danube, and gain insight into the Hungarian culture in the form of folklore songs and dances. What are the most well-known types of this traditional folk dance of Hungary? Nowadays we say, there are two different types of folk dance and these are the old style and the new wave of the Hungarian dances. We give you a little lesson of the Hungarian folk music, in case you face them during your stay in Hungary and it will feel much better for you to know what do you see exactly. This knowledge will give you self confidence in recognizing a part of the Hungarian culture. Let us have a quick look at the old style first. Exactly what it is, performed only by young women, who are singing traditional songs while walking around and end up forming a circle and continue dancing around and singing. As they dance they speed up and slow down based on the music that is, of course, most of the time about love. This dance was the main form how they were allowed to dance in the middle ages in Europe, couple dances and dancing in pairs took place of folk music later in time. They dress up usually very colorful, one of the main colors is red. This red symbol can be found in their hair and on the skirt as well. Of course, the classic boots cannot be missed either. As the ladies had they own dance type, this second type of dance was performed only by men, who were accompanied by instruments just like bagpipes, shawms, fiddles, and drums while dancing the „pásztortánc” and were dancing with a real stick as they performed a wild „hajdútánc”. Again a dance type which was performed by men, but this type of folk music was performed alone, as a freestyle, solo dance in front of a band. What you can see is a dance mixed with jumping, heel-clicking and running as well and this is still the most favorite and popular folk dance style of the Hungarian culture. When we say „New wave” in folklore music and dances it is rather "not so old" (from two century before) than "new". These dances appeared in around the 18th and 19th centuries and comparing the old style even the music and even the dresses were like more colorful, dynamic and energic. just like the last 2 dance type we mentioned, verbunk is a dance often improvised by men only. Different from the „ugrós-legényes”, because of the music and the history of how this dance was developed. Basically, this dance was developed by the Austro-Hungarian army for recruitment purposes. Looks fun, right? many young boys in Hungary were lured into the army by the belief, the army is about a lot of music, dancing, and drinking. Probably the most famous traditional Hungarian dance is the csárdás, which is a couple dance. Usually starts slowly, but it has a quick, more rhythmic style as well. 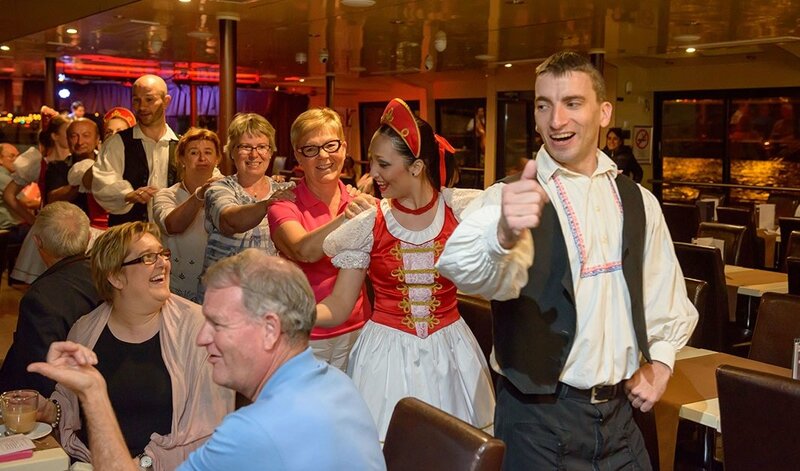 We kindly recommend our dinner cruise accompanied by our operetta and folklore performance for all those, who enjoy quality entertainment and are interested in getting to know the Hungarian culture. Explore the world of Hungarian folklore and operetta, while enjoying the view of the luminous panorama of Budapest. During the 3-hour long cruise, we serve a four-course dinner to our dear guests, while they take a look at the most beautiful sights of the capital from the Danube. While assembling the performances and the menu of the cruise, we paid special attention to introducing the essence of Hungarian culture and cuisine. Our luxurious cruise ships were built specifically for the purpose of such complex events.